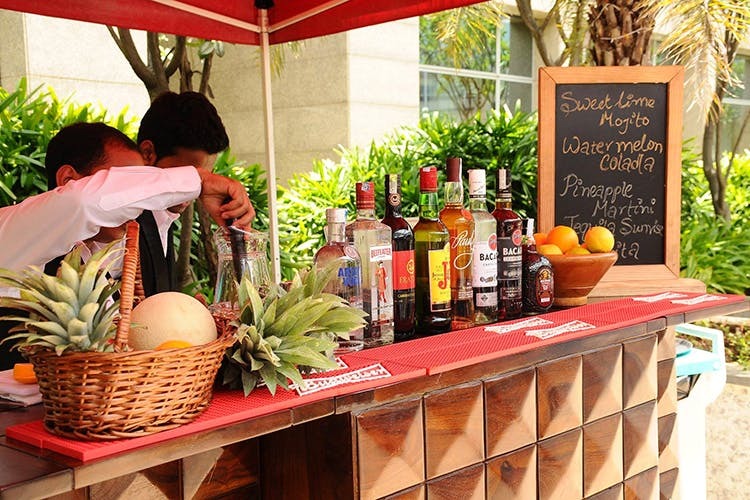 Forget waking up early on Sundays, instead wake up on an easy breezy Saturday and head to Hilton Bangalore Embassy GolfLink for their cool brunch. And the best part? You can jump right into the swimming pool too. Called the Dress Down Saturday Brunch, in addition to offering a range of food and drinks, the ambience will make it worth your while. Why, you ask? Because it’s by the gorgeous azure swimming pool. Oh, and did we mention it’s INR 999 for the non-alcoholic option and INR 1,499 for the alcoholic one. Plus, taxes. If you plan to go this weekend, or any other upcoming Saturday, here’s what you can expect, in addition to a merry old time! There are plenty of live counters for you to customise your meal starting with a pasta and salad station. Then make your way to the enchilada section for a hint of Mexico before loading up of kebabs that arrive at your table in a steady stream through the brunch. Before you tuck into dessert, dive into the pool to lounge around. Or in fact, maybe even swim around before you start the brunch, and build up a solid appetite. Come on, how many hotels allow you to use their pool through the brunch. We also love the Khao Suey section where you can create your own Burmese staple and add in as much of the garnish as you like and no one will judge. There is also a desi section which will sort you out with everything from kathi rolls to neer dosa. Naturally, it can all be washed down with cocktails or even straight spirits. But don’t leave without having dessert. Pineapple Upside Down Cake, Apple Crumble, Baklava, Coffee Pound Cake and Rasmalai are all on offer.